Well,Twitter the best micro niche blogging site is known to everyone and dont need any introduction.There is a huge rush of audience over there and you might be one out of them.Tweets keep coming from the Twitter users.The word tweet is now like a brand and you might be the user of this brand as well. Posting tweet in Twitter account is similiar to posting status in Facebook.Yet people find it more comfortable to post status in Facebook rather than posting tweets in Twitter. I have found a great way of auto tweeting in Twitter at regular shedule without even logging into your account and the service is Twitterfeed.com Hope you have heared of it from any of your friend.Its a great service with simple steps involved in it for using it. Well this is service which let you post Rss feeds updates from Feedburner directly to your Twitter account.The source of feeds can be from your own website feed ofr from any other feed of any website. 1. 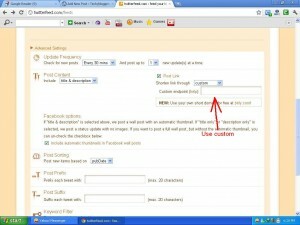 First you need to have account at Twitterfeed.com(its free) and ofcourse at Twitter as well. Just give a name to your feed.The enter source of your feed. 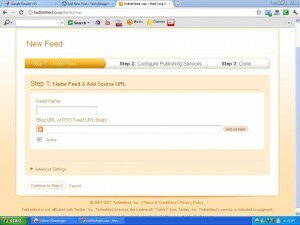 The link of feed can be easily found by using Google Reader. 3.Then you have to chose the appearance of your link in advanced settings there.By default the Twitterfeed will be using the Bit.ly link shortner but we can go for any choice we want. To proceed with it is good to use custom links option from the no of options out there.The screen shot will gove better idea. 4.Then you proceed to step no 2 which is of autorizing you Twitter account.For this just sign in to your Twitter account and just authorize Twitterfeed app. Nothing just check the service working well there and enjoy it. What else we can do with Twitter feed? This service is very loved by bloggers as they tweet their blog posts automatically but what else can we do with it. The answer is we can easily make money from it.For this you need to have adf.ly account. Adf.ly is a service which pays you when someone visit your adf.ly created link.They pay decent amount of money for 1000 visitors.Check more at adf.ly official. Once you have created your link then use that link in custom field option in Twitterfeed (of step no 2).Then each Rs feed will be automatically converted into adf.ly link and it will be tweeted on your twitter account as well. Hope you like this.Take a moment to share it with your friends on Facebook,Twitter.